At the turn of the twentieth century, Lynchburg had a thriving art scene. Dozens of young, well-trained artists congregated here and inspired each other. Many of them have since become nationally known, enhancing the city’s incredible fine arts legacy. 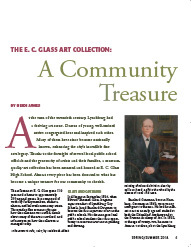 Thanks to the foresight of several local public school officials and the generosity of artists and their families, a museum-quality art collection has been amassed and housed at E. C. Glass High School. Almost every piece has been donated to what has become a unique treasure for our community to cherish. The collection at E. C. Glass spans 119 years and is home to approximately 200 original pieces. It is comprised of works by faculty members, students, alumni, and beloved community artists. This article offers some insight into how the collection was started, details about many of the artists involved, and information on how the collection is managed today. Entire article available only in printed version. Lynch's Ferry is on sale at the following Lynchburg locations: Bookshop on the Avenue, Givens Books, Lynchburg Visitors Center, Old City Cemetery, Point of Honor, Market at Main, and Lynch's Ferry office at The Design Group. Originally from Michigan, Heidi James moved to Lynchburg in 1989. She and her husband, Blitz James, have been renovating a 1920s family home on V.E.S. Road. James worked with the Lynchburg Historical Foundation for ten years during the 1990s. She served as president of Rivermont House, Inc., a non-profit dedicated to restoring the Rivermont House on F Street in Daniel’s Hill. The Rivermont House was successfully rescued; in 2010 it was sold to an individual who will continue the interior restoration and make the house a private residence. 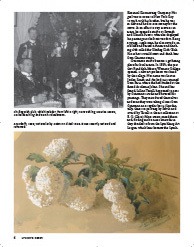 She has also served as president of the Lynchburg Garden Club and as historian of the Garden Club of Virginia. She was a founding member and the first president of the Friends of the E. C. Glass Art Collection. The author is a 1982 graduate of Salem College in Winston-Salem, North Carolina. This is her second contribution to Lynch’s Ferry. “The History of Riverside Park in Lynchburg, Virginia” appeared in the Fall/Winter 2007 issue.